crab linguine is a much-loved dish for both david and i. it’s very quick to make and, if we use the tins of white crab meat which are easily available at most supermarkets, it is a great store cupboard supper. the meal above was a variation on our usual recipe as i used dressed crab. this completely changed the dish, with the brown meat adding a lovely richness and depth of flavour – i used this to dress the linguine and then topped it with the white crab meat. i also sprinkled it with some of the herb powder i made for last month’s daring cooks challenge of fish with powders. put your pasta on to cook and separate the brown and white crab meat. heat the olive oil and gently fry the garlic and chilli until they soften and you are able to smell them. turn the heat off and add the brown crab meat, lemon zest and lemon juice. when the pasta is cooked toss it with the brown crab sauce and watercress, adding a little water if necessary, so it becomes lightly coated with the sauce. 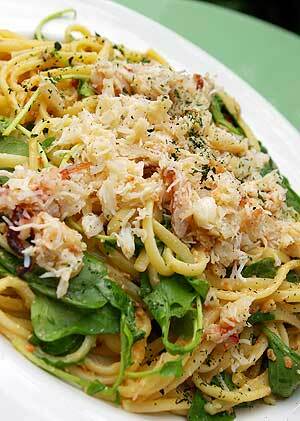 divide the pasta between two plates and top with the white crab meat then serve.